Today was the last possible day for mission controllers to adjust the trajectory of the New Horizons spacecraft as it approaches Ultima Thule, a distant Kuiper Belt object. With no detectable dangers in sight, NASA has given the green light for the spacecraft to remain along its optimal path—a trajectory that will result in an intimate flyby in just two weeks time. For the past three weeks, the New Horizons hazards team has been on the hunt for anything around Ultima Thule, like bits of dust or rock, to warrant a course correction. This celestial game of Choose Your Own Adventure had one of two possible outcomes. With a clear pathway ahead, New Horizons could stay along its current course, taking it to within 2,200 miles (3,500 kilometres) of Ultima Thule, also known as 2014 MU69, during the scheduled January 1, 2019, flyby. 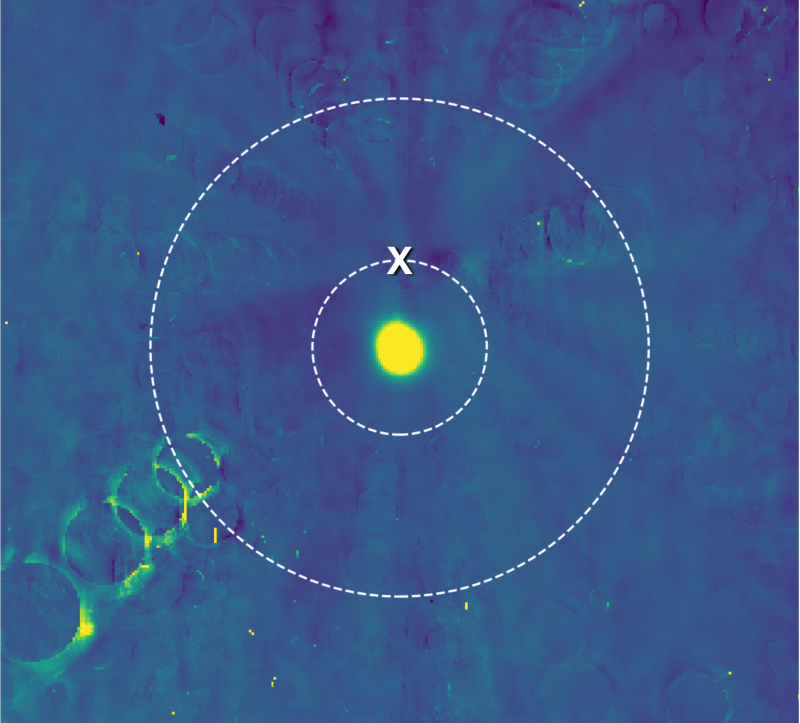 If hazards were detected, however, the resulting course correction would have taken the probe three times further away from the mysterious trans-Neptunian object. New Horizons is currently moving at a whopping 31,500 miles per hour (50,700 kilometres per hour), a speed at which even a small rice-sized grain of dust would wreck the spacecraft. This image of Ultima Thule was made by combining hundreds images taken between August and mid-December by New Horizons’ Long Range Reconnaissance Imager (LORRI). The inner circle represents the close course, and the outer circle the farther path.Image: NASA/Johns Hopkins Applied Physics Laboratory/Southwest Research Institute. Earlier today, and with no immediate threats detected, NASA gave the green light for New Horizons to take the inside track to Ultima Thule—no course correction required. This is great news, because a more distant flyby would’ve produced less-detailed data. New Horizons is now projected to capture images of Ultima Thule with a resolution as fine as 98 to 230 feet (30 to 70 metres) per pixel. When it flew past Pluto, the resolution was around 600 feet (183 metres) per pixel. Ultima Thule is thought to be a close binary system or a contact binary (in which two pieces are touching). The object, or objects, are around 19 miles in diameter (30 kilometres) and irregularly shaped. Consequently, the incoming images should be super fascinating. This isn’t the first time that the New Horizons hazards team has been put to work. Three years ago, when New Horizons was approaching Pluto, the team used the probe’s Long Range Reconnaissance Imager (LORRI) to look for potential hazards. They were concerned that Pluto’s small moons had spread dangerous debris across New Horizons’ path. Thankfully, their search yielded nothing, and New Horizons was allowed to stay along its intended path through the Plutonian system. In the case of Ultima Thule, which is located a billion miles past Pluto, the hazards team used LORRI to search for similar threats. Specifically, the team was on the lookout for a reflective ring composed of dust. They also searched for tiny moonlets around Ultima Thule. Neither dust nor moons were found, allowing for today’s “all clear” declaration. New Horizons is scheduled to make its closest approach to Ultima Thule at 12:33 a.m. EST on January 1, 2019. We don’t know when we can expect to see the first close-up photo of Ultima Thule, but transmissions from New Horizons will take approximately six hours, seven minutes, and 48 seconds to reach Earth.